The crest of the Greater Caucasus forms a boundary between the temperate zone and the subtropics: the Caucasus Foreland and the northern macroslope belong to the temperate zone; the southern macroslope and Transcaucasia belong to the subtropics. The southern position of the Caucasus results in high values of incoming solar radiation which ranges between 120 kcal cm-2 a-1 in the Caucasus Foreland and the Colchis lowland (which has a cloudy climate) and 170 kcal cm-2 a-1 in Armenia. In summer, the Caucasus is dominated by subtropical high pressure in the west and the Asian depression in the east; in winter, it is affected by the western extension of the Asiatic (Siberian) high. Superimposed on the general circulation pattern is the influence of the Black and Caspian Seas and orographic effects. Thus in winter, the Mediterranean and Iranian depressions regenerate over the Black Sea and the Caspian bringing abundant precipitation. Since the upper flow is generally from the west, the influence of the Black Sea is greater, extending over the western Caucasus Foreland and western Transcaucasia. The effect of the Caspian is mainly limited to the coastal regions. 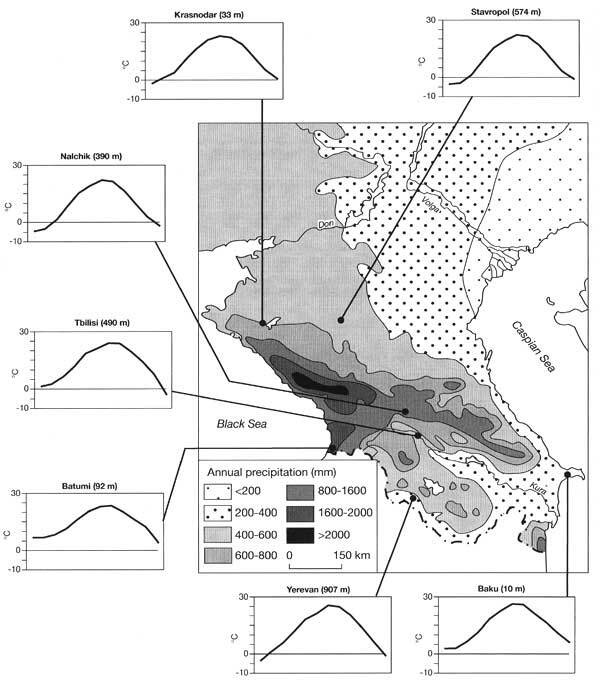 The intensification of cyclonic activity in winter results in high seasonal precipitation which is greatest along the Black Sea coast, increasing eastwards from 690 mm a-1 in the region of Novorossiisk to 2500 mm a-1 in Batumi (Figure 15.2). The Greater Caucasus blocks and deflects the air flowing from the East European plain and the polar air can only penetrate Transcaucasia either via the Black Sea or via the Caspian. This circulation pattern, known as orographic occlusion, gives rise to prolonged precipitation on the windward slopes. If the cold air mass dammed on the windward side of Caucasus becomes sufficiently deep, it can spill across the low western and eastern edges of the Glavny Ridge, creating strong downslope winds. On the lee side of the mountains, these are termed bora. This is particularly typical in the north-west in the bay of Novorossiisk, where in winter wind speeds reach 40 m s-1 and temperatures falls to -20°C, and in the Apsheron peninsula in the east. Otherwise, the winter climate is generally mild, especially in western Transcaucasia. Temperature extremes tend to increase eastwards with increasing continentality while precipitation declines (Figure 15.2). The Stavropol upland in the Caucasus Foreland and the Surami Ridge in Transcaucasia form important climatic divides. The elevated Stavropol plateau limits the migration of depressions from the Black Sea and anticyclonic weather is prevalent here in winter. Temperatures can drop below -30°C and seasonal freezing of soil occurs to a depth of 30-50 cm. In Transcaucasia, the difference between west and east is particularly strong with regard to precipitation. The air, advected by depressions from the Black Sea, loses most of its moisture over the Colchis lowland and, having crossed the Surami Ridge, descends in the Kura lowland as a dry airflow. Temperature distribution is controlled primarily by local factors including frequent fohns. The highest degree of continentality is characteristic of the landlocked Armenian-Dzhavakhetian plateau. A local zone of high pressure develops over Armenia under the clear-sky conditions in winter and radiational cooling brings about temperatures that are very low for this latitude (Figure 15.2). In the vicinity of the Caspian Sea, precipitation and temperature increase again. Warm air is transported along the periphery of the Asian high from Asia Minor, Iran, and Afghanistan although occasional penetration of cold air from the East European plain brings about cold weather. A particularly warm and humid climate develops in the Lenkoran lowland, separated from the rest of eastern Transcaucasia by the Talysh mountains, under the influence of the Caspian Sea. Frequent fohns often raise winter temperatures to 25°C. The ascent of the Caspian cyclones, which are particularly frequent in autumn, over the Talysh produces high precipitation that exceeds 1000 mm a-1 in the foothills. The most distinguishing features of the summer climate are high temperatures and intense thunderstorm activity. Thunderstorms, accompanied by hail, are particularly frequent in the western part of the northern macro-slope of the Greater Caucasus and on the Black Sea coast, where intense convection is matched by the high moisture content of the air. The plains and the foothills of the eastern Caucasus Foreland are distinguished by a dry climate with frequent droughts, dry winds, and dust storms. Similarly, dry summer climates are typical of the Kura-Araks depression. The Armenian-Dzavakhetian volcanic plateau experiences a precipitation maximum in May-June when the Polar front migrates into the region but the period between July and September is very dry and the midday relative humidity does not exceed 30-40 per cent. strong insolation and low actual evaporation result in very high temperatures. Maximum temperatures above 35°C are registered on more than 50 per cent of all days in July-August at absolute heights of 900-1000 m.
The climate of the high mountains results from the interaction of processes, operating in the free atmosphere, and topography. Altitude controls insolation and temperature; the overall dimensions and orientation of the ridges in relation to the westerly flow are important for the general distribution of precipitation and accumulation of snow and ice; relative elevation, the shape of terrain, slope angle, and aspect result in strikingly different regional and local climates. The main features of high mountain climate are the decline of temperature, humidity, and precipitation and the increase of the westerly wind with altitude. The precipitation maximum occurs at the flrn (neve) line, the altitude of which increases eastwards from 2800 m on the south-western macroslope of the Greater Caucasus to 3400-3600 m in the east (Table 15.1). The maximum amount of precipitation occurs in the south-west, reaching 3000-4000 mm declining eastwards and north-eastwards. In the central Greater Caucasus, precipitation ranges between 1000 and 2000 mm at 3000 m and in the eastern sector it declines to 750-1500 mm (Krenke, 1982; Dolgushin and Osipova, 1989). The abundance of snow, the widespread occurrence of steep (over 25°) slopes and numerous glacial troughs cause a high frequency of avalanches. In the Greater Caucasus, avalanches occur above 1500 m on the northern slopes and 500-800 m on the southern slopes; their frequency declines from west to east in line with the decline in precipitation.